Interior design in Lexington means Adelé, located in Chevy Chase, next to Josie’s. Since 2011, Adelé has provided our clients with sensible, uniquely tailored solutions to recreate their space as a functional, luxurious haven. Adelé consistently exceeds our clients’ expectations with personalized service, the best quality for their budget and on-schedule completion, allowing our clients to have a stress-free, enjoyable experience in creating the space of their dreams. 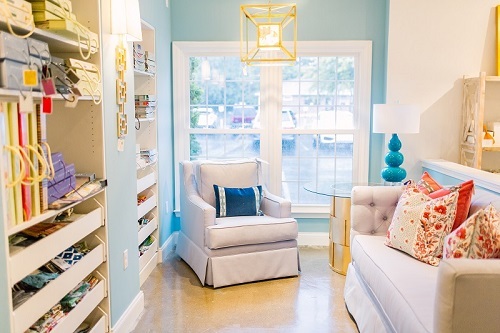 Adelé interior design Lexington offers services that include designer fabrics and wallcoverings, custom window treatments and pillows, re-upholstery and in home consultations. Adelé designs for you, your family and your lifestyle by collaborating and partnering together to develop your design plan. We infuse your desires, while focusing on your priorities. Together, we will create the best possible plan for you. We work as a team with our clients. We learn about their personalities, styles and requirements, so when our work is done, the space is reflective of them, not us. Unlike other interior designers who stamp their projects with their signature, Adelé only leaves behind a timeless, customized design that our clients can own and appreciate. Adelé knows that a positive relationship with our clients is the key to successful design. Our experience has taught us the importance of establishing common goals early on in order to ensure that the results we deliver are the result our clients want. We always place our clients’ wishes first as it is their space. We have the experience and flexibility to guide our clients through every step of the interior design project, from design and planning to implementation. Adelé provides interior design services for new home construction or refurbishing existing home spaces. We provide careful coordination with a blend of function and aesthetics, while keeping our client’s budget in mind. Our Adelé design consultation meetings are casual, fun and collaborative. We meet at the client’s home to properly assess the space of the project and discuss the client’s needs, requirements and budget. Afterwards, we suggest design ideas and creative solutions to enhance the space, which include color palettes, wall coverings, fabrics, furniture arrangement, décor style and space challenges. Once the work has begun, we keep projects on track through easy communication and proven organization and project management skills. Whether it’s redecorating one room or a whole house, Adelé specializes in creating timeless, beautiful interiors. Our forward-thinking approach at Adelé allows us to be leaders in interior design in Lexington. Adelé is an innovative interior design firm that blends the creativity of design with the practicality of business. Our passion for well-edited and clean interiors is balanced by our skill at delivering smart functional spaces that really work for our clients. Adelé has had the distinct pleasure of working on some of the finest homes throughout Lexington and Central Kentucky. When you choose Adelé, you’ll quickly learn how passionate we are about meeting your needs and vision. Together, we will develop a desirable living environment that exceeds your expectations each and every time. Our interior design services are supported by an equally strong commitment to reliability and dependability. We adhere strictly to project timelines and budget considerations. Adelé excels in transforming everyday living spaces into one-of-a-kind environments that radiate warmth, innovation and livable luxury. Adelé delivers the highest level of creativity, service and project management. From concept to completion, Adelé offers a full array of interior design services, an uncompromising commitment to quality and exceptional customer service. We charge an hourly consultation fee for design.